The area of the municipality is 1043 km2 and includes inspections of police Maguaré, port Manrique, port Hungary, Peñas Negras and Berlin. The municipality of El Doncello consists of a fairly large number of trails, is located in the foothills of the slope East of the mountain range of the same name presents a shared topography between mountains and plain skirt. Its urban area is located at an altitude of 480 metres above sea level with a temperature of 26 degrees Celsius. 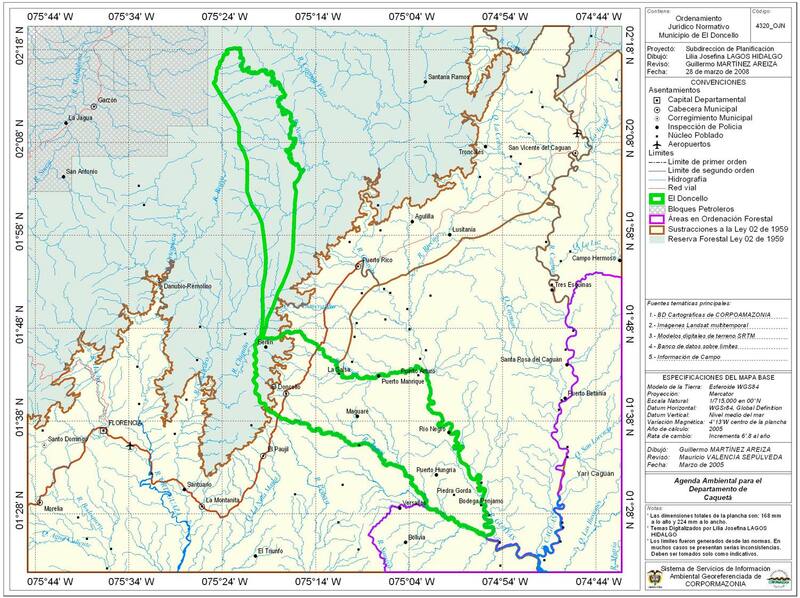 Taking as a point of departure the birth of the river Anaya; This place straight North until you find the highest Ridge that divided the Department of Huila with Caquetá and following this same limit until the birth of the river Nemal front; from this point in a straight line, downstream to its mouth at the Guayas River; Guayas River down to the mouth of the river Anaya; River Anaya up until birth (first point of departure). Despite being the second county seat in terms of location in the Department after Florence and in addition to providing better urban conditions than other towns of Caquetá in relative terms, economic activity keeps characteristics of informal due to the abrupt and disorderly growth of the urban population and minimum conditions of structure that will allow an important dynamic. Account with an access road from the city of Florence, passing through the municipalities of La Montanita and El Paujil, continuing its tour to the municipality of San Vicente del Caguán, passing through Puerto Rico, this pathway is paved all the way, introducing faults in some sections. Social and shepherding house, is part of the parish complex and works as home and accommodation place for priests. The "Anaya" cross is a monument built by an Italian misssion, arranged and requested by the Father Juan Demichelis.